Silver bars are manufactured by several private mints including Johnson Matthey, located in London, England. The company began with a young man’s dream to become a gold assayer, when Percival Norton Johnson, in 1817, launched his first business. Today, Johnson Matthey has gone from a precious metals assayer’s dream to one of the world’s leaders in science and development of technologies for clients all over the world. Johnson Matthey, also known as JM, has received many of the Queen’s Awards for incredible advancements in not only precious metals, but also innovative manufacturing. Johnson Matthey invented and manufactured the very first catalytic converter to control vehicle pollution at their Royston plant in the United Kingdom in May 1974, which to date has been their crowning achievement. It’s been almost 200 years since the establishment of Johnson Matthey, and silver bullion minted by this precious metal leader are still highly sought after. Investors favor these bars due to their high quality and the company’s extensive and exemplary history. The Johnson Matthey stamp that has JM next to crossed hammers on any of bars indicates a Johnson Matthey product, and thus the reliability of the silver content. The 100 oz. Johnson Matthey bars are favored for their easy to store size and low premiums over spot. They are 6.5 x 2.5 x 1.25 inches – if two graphic calculators were stacked on top of each other that would be roughly the size of one bar. Some 100 oz. Johnson Matthey silver bullion bars have an individual serial number on them, but they only stamped serial numbers on bars that were sold to commodity exchanges. The 100 oz. Silver bar is typically not considered an exchange product, but was minted as a retail product. There are upwards of a few hundred 100 oz. silver bullion bars with a serial number on them, which indicates they were minted many years ago. Johnson Matthey did not keep a record of serial numbers. As long as a silver bar of any size has the JM logo, it is an authentic Johnson Matthey product. Johnson Matthey silver bullion bars are recognized by any well-researched investor, and not only provide long-term investment security, but also are equally liquid when needing to sell. They’re intended more for investment and storage rather than being known for intrinsic or collectable value. It was during the 1970s and 1980s that Johnson Matthey produced the largest quantities of silver bullion due to the high demand for silver in an investment form versus collectable value. They ceased minting their bullion bars in the 1980s, which added more of a scarcity and then actual collectability to their silver bars. In 2012, after more than 30 years, a wholesale dealer in Dallas, Texas, Dillon Gage Metals, is distributing new one-ounce silver bar minted for Johnson Matthey. 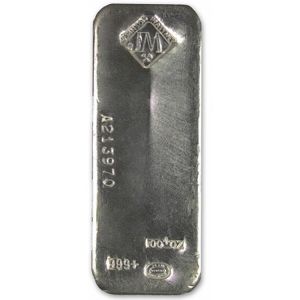 They carry the JM insignia and are the first to be minted since JM silver bar production was stopped. Although Johnson Matthey is not minting these bars themselves, the long history of incredible precious metal products precedes this new silver bullion bar, creating a frenzy of sales for this investment silver bullion.